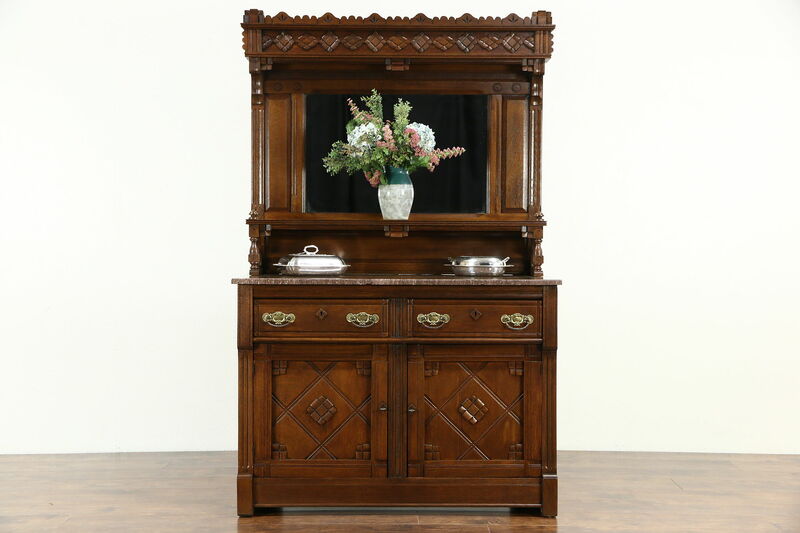 An opulent sideboard, server or buffet in solid oak has a marble top and beveled mirror in the galleries. Detailed carving shows late Victorian or Eastlake influence. The restored finish is in excellent condition on this American made antique furniture. There are scratches in the mirror, see photos. The Tennessee Red marble top has a professional repair and has been polished and sealed to resist stains. Doors have working locks and slight warps from age as shown. Drawers have original hardware and round "pin and cove" dovetail joints, characteristic of the era. Measurements are 49" wide, 20" deep, 76" tall and the marble top is 35" high.